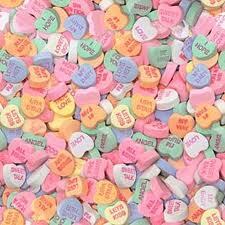 hearts totaling about 100 calories devoid of any nutritional value. flavors? Am I supposed to believe that the various colors are different flavors? sayings, phasing some out and adding new ones. Some of the sayings that have beenretired over the years include “DIG ME,” “HOT CHA,” “SAUCY BOY,” “GIRL POWER,” “OHYOU KID,” “GROOVY,” “COOL DUDE,” “MY, SUCH EYES,”  “FAX ME,” “HEP CAT,” “1-800 CUPID,” “YEAH RIGHT,” “OH BOY,” “YOU ROCK,” and “LET'S READ.”  Let’s Read?? Some of the newer sayings include “UR HOT,” “TEXT ME,” “LOML” [that's: Love of My Life], “#LOVE,” "MELT MY HEART," "IN A FOG," "CHILL OUT," and "CLOUD NINE." This entry was posted in Humor on February 10, 2014 by Leonard.